What: Talk, book reading, book signing, light refreshments. 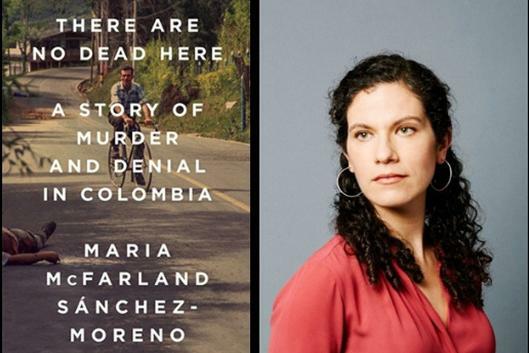 Duke University has named María McFarland Sánchez-Moreno's book, "There Are No Dead Here: A Story of Murder and Denial in Colombia" (Nation Books, 2018), as the winner of the 2018 Juan E. Méndez Book Award for Human Rights in Latin America. McFarland will visit Duke University on February 26, 2019, to receive the award and discuss her book. "There Are No Dead Here" is a deep dive into key human rights cases that exposed the murderous nexus between right-wing paramilitaries, drug lords, and Colombia's military and political establishment. Through dogged reporting, in part as a Human Rights Watch researcher, McFarland unravels the links that led to the murders of Colombian rights investigators by powerful interests that reached as high as military leadership and even the Colombian presidency. This award honors the leadership of Juan E. Méndez, a human rights champion who has devoted his life to the defense of human rights. First awarded in 2008, this award selects among the best current non-fiction books published in English on human rights, democracy, and social justice in contemporary Latin America.